Raccoons, originally uploaded by Elizabeth Smith. 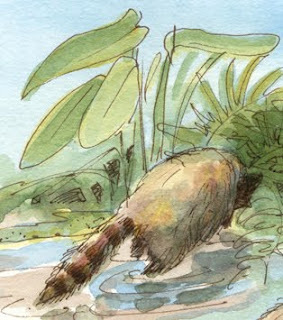 Late afternoon Sunday I took a stroll along the boardwalk at Freedom Park and came across three raccoons wading through the shallow marshy areas, and digging in the mud below the bases of alligator flag and swamp ferns. Although they didn’t seem to object to my presence, they kept their backs to me and steadily headed in the opposite direction. This is our dry season, with a heightened risk of fire and drought, but last Friday we had a nice drenching rain. I noticed that the shallows flurried with many small signs of life, and no doubt the raccoons were feasting well. Pickerelweed and duck potato were in bloom, and two stalwart blue irises. A wood stork clacked his bill at me from a nearby cypress tree, and in the distance, I heard the distinctive calls of cardinals and redwing blackbirds. 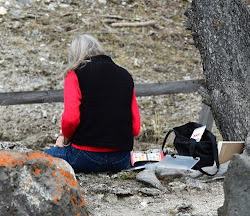 Nature and art in one – a great way to spend an hour or so, and a wonderful way to start the week! You can click on the very top image to view it larger on my Flickr photostream. What a nice sighting Elizabeth! Not only are the raccoon wonderful, but I appreciate the ambiance of the whole situation. You painted a lovely picture with your words as well as your paints. What a delightful way to spend some time. 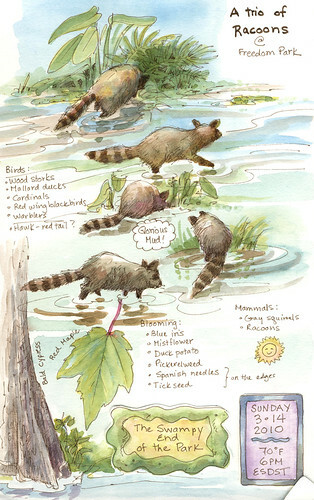 The raccoons are so cute, and I love the details you included on your page. These are soooo great, Elizabeth. What a treat! Thank you all for visiting and letting me share! It was a great afternoon! Your sketches are delightful. 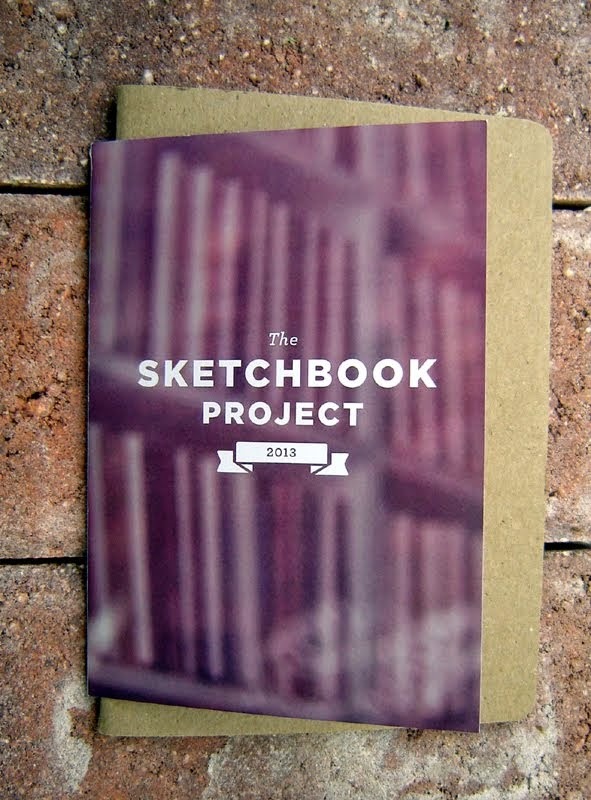 Have you ever written /illustratd books. Your animals are like characters in a book. They have so much personality. What a delightful page. It would have been so fun to have watched them. The page definitely gives the sense of 3 little rascals .... separate personalities. Thanks, Claire. They were quite the treat to watch! Thank you Stephan! The raccoons themselves were very inspiring!